On Sunday 19th November 2006 Dian Khan was married to Geoffrey Boardman-Hadaway by Rev. George Frederick on the familyâs lawn at Rose Cottage, Villa. The Bestman was Mr. David Robin and Matron of Honour Mrs. Rawtie Khan. 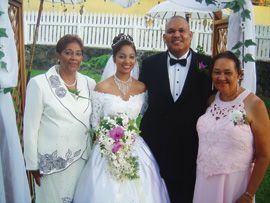 Family and well wishers journeyed from Trinidad, the USA and Canada. Following the ceremony a reception was held at the Lime N’ Pub.